Ever changed a file and saved it, only to realize that the original was much better? Ever wanted to start from scratch from a document you changed last week? A new feature in some versions of Windows Vista lets you retrieve previous versions of files and folders. Vista’s Business, Ultimate, and Enterprise versions now inventory your PC’s nether reaches, letting you send down a grappling hook and retrieve an old version of a file you’d long ago given up as lost. To find and retrieve an older version of an existing file, right-click the troublesome file, and choose Restore Previous Version. In the window that appears, Vista lists all the previous versions available for that particular file, leading to the big question: Which version is the one you want? To take a quick peek at a previous version, click its name and click Open. Vista opens the file, letting you see whether you’ve struck pay dirt. 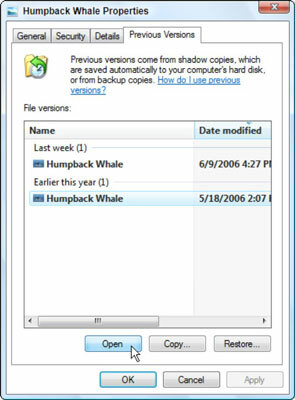 Vista tracks previous versions of your files, letting you return to older versions in case of a mishap. If you’re positive that the older version is better than your current version, click the Restore button. Vista warns you that restoring the old file will delete your existing file; when you approve the deletion, Vista puts the restored version in its place. If you’re not quite sure whether the older version is better, a safer alternative is to click the Copy button, instead. Vista lets you copy the previous version to a different folder, letting you manually compare the old and new files before deciding which one to save.